Who will face Julian of Norwich in the Championship? That’s what this match-up between Theresa of Avila and George Herbert will determine. Will it be an all women’s final? Or will George Herbert be able to pull off the upset? So far he’s been the cinderella of Lent Madness. But midnight is soon approaching. As we did with the other Final Four match-up, I’m posting a single hideous work of art depicting the saint in question. The medium doesn’t matter — painting, sculpture, stained glass. It just has to be ugly. Or bizzarre as is the case with this representation of Theresa. Okay. Ugly and bizarre. Am I the only one worried that she’ll ruin her white dress? I’m afraid there’s no bad art of George Herbert. He just doesn’t lend himself to it — which is either a plus or minus depending on your perspective. A bad painting of George Herbert Walker Bush will have to suffice. Gah! How dare you tarnish the reputation of George Herbert by invoking George H. W. Bush! I hope this does not harm our noble poet in this competition. Tim, you may have baited Scott past his normally high and noble level of tolerance. 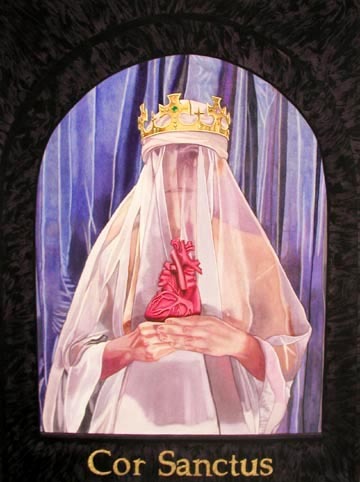 Your choices of bad art have exceeded my wildest dreams, and that’s really something “special” because it’s a tossup for me between religious kitsch/Bad religious art/STUPID Liturgy/Hohohorrrrid vestments… Gag… Hack…’Cuse me I fell into a rant…and purple writing. 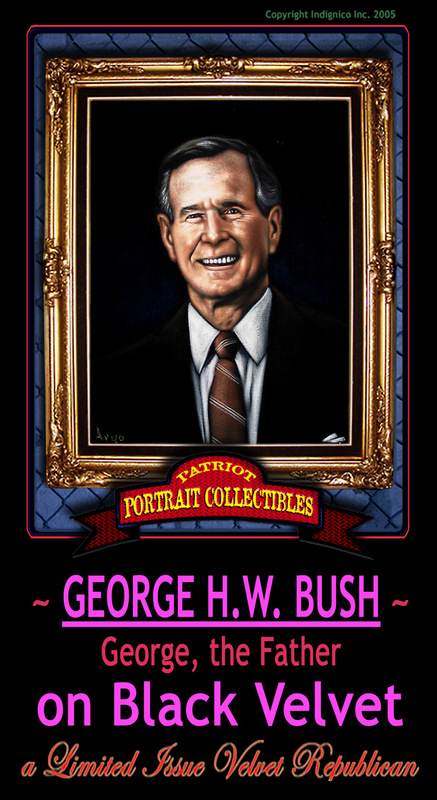 To complement GHW Bush’s portrait on velvet I submit this quote from George I: “I have lots of opinions — strong opinions — but I don’t always agree with them.” So there. Ahem… Tim, please refer to long-ago msg re: AidAn… not that he’s likely to appear here again, unless you do a Losers Lent Madness before the Rapture. Fr. Gunn has explained to me in great detail how painful my loss of eternal salvation will be if I do not vote for George Herbert. Yeah, well…give me a call and I’ll explain the fires of eternal hell if you don’t vote for Theresa. What a terrible thing to have to choose between two such stellar people! (And I can’t think of any two people less alike than George Herbert & George Bush 41!) With deep apologies to Teresa, I’m going with Herbert on this one. His poetry is sublime. And in English. The hymns made the difference. But watch out in the final showdown, George, Dame Julian has a cat. Got to be Theresa of Avila if only to get an all woman final in something for once!! As I’ve been cautious to avoid mixing politics with religion, I cast no ballot, save to share Julian’s mystic vision that “all will be well” – as all who are called to Christ are winners in the final victory. There may be a hanging Chad, but we know there can’t be pregnant Chad. This is because St. Chad is male. When does this poll officially close? I’m getting a little nervous about the potential for last minute hanky-panky. It would be most unfortunate to have to convene an Ecclesiastical Court to declare George H. as the true winner. It’s in the books! Theresa falls to George Herbert. Go vote in the championship!